Sometimes you need a little fluffy to make everything all right. No, no, no a fluffy, not a Furry. 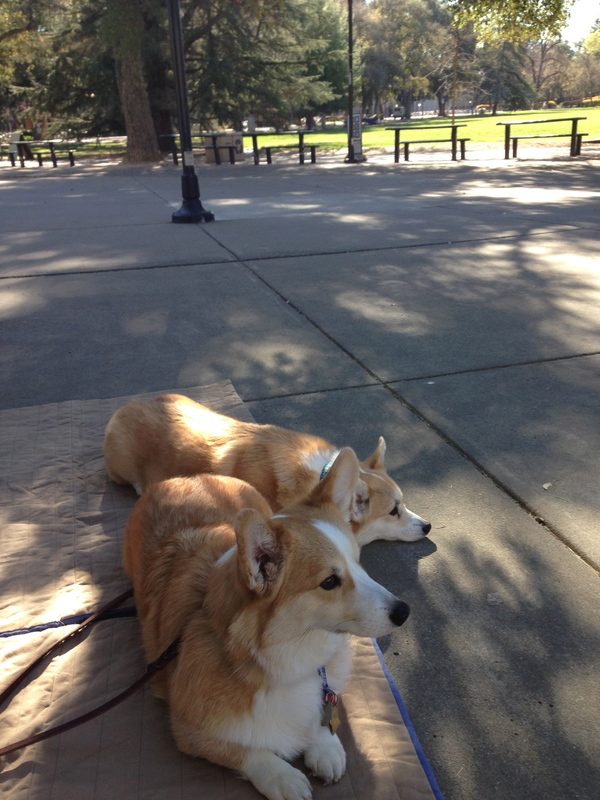 I’ve mentioned Emma and Tanner the Corgis in a few previous posts. I write with them and they are both trained as Therapy Dogs. 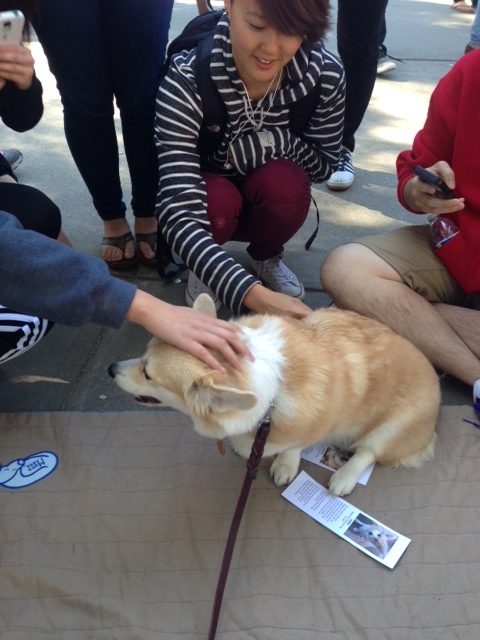 Today, Emma and Tanner joined with nearly a dozen other Therapy Dogs in a gathering at the campus of the University of California at Davis for a Therapy Fluffies Event, sponsored by the Student Health and Counseling Services Organization on campus. It was finals week at U.C. Davis and I don’t know about you, but back in the day, (yes – way, way back for me, thank you) finals or mid-terms were nausea inducing panic sessions. Nights of caffeine fueled study sessions meant when the test paper hit your desk, it started to absorb all the flop sweat and shame you collected that semester. Fun memories, yes? 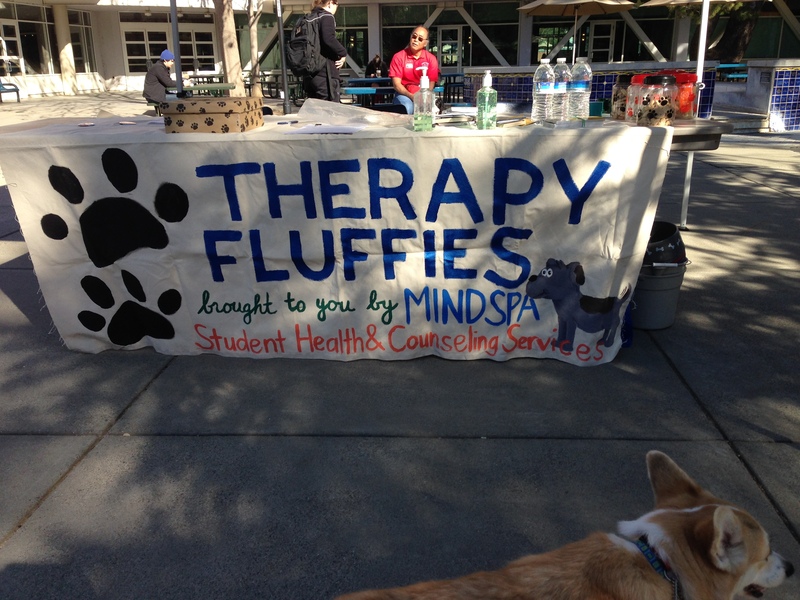 The University started the Therapy Fluffies program four years ago as a means of blowing off stress and decompressing after finals. This year, social media on campus lit up prior to the event and 1,700 students said they would drop by. I don’t have a final count, but the turn out was far higher than projected. The local television news had cameras at the event and Tanner posed for dozens of selfies with students. As you can tell, Tanner really got into the spirit of decompression. 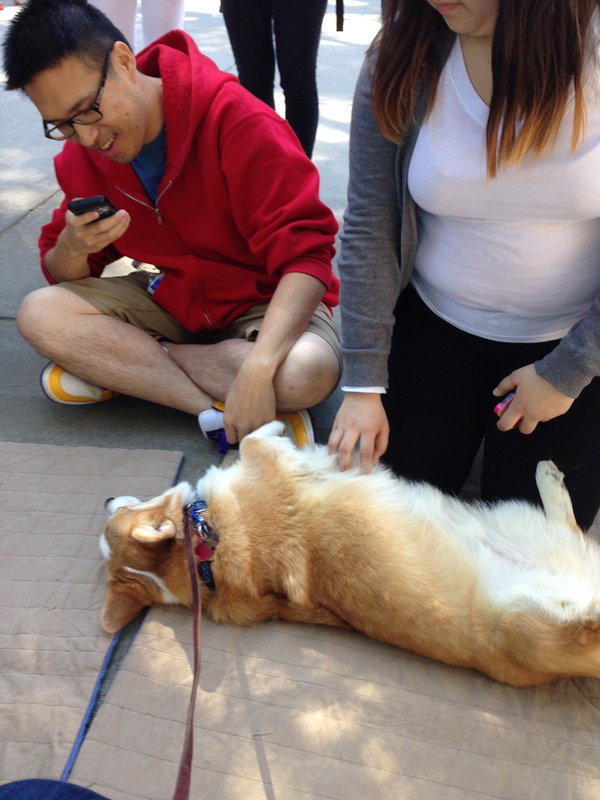 I heard students say that they missed their dogs back home, how spending time petting a corgi made all the test stress disappear and as soon as they saw the dogs, a few claimed they began to relax. No one even cared that some old guy was on the other end of the leash, all attention was on the dogs, as it should be. 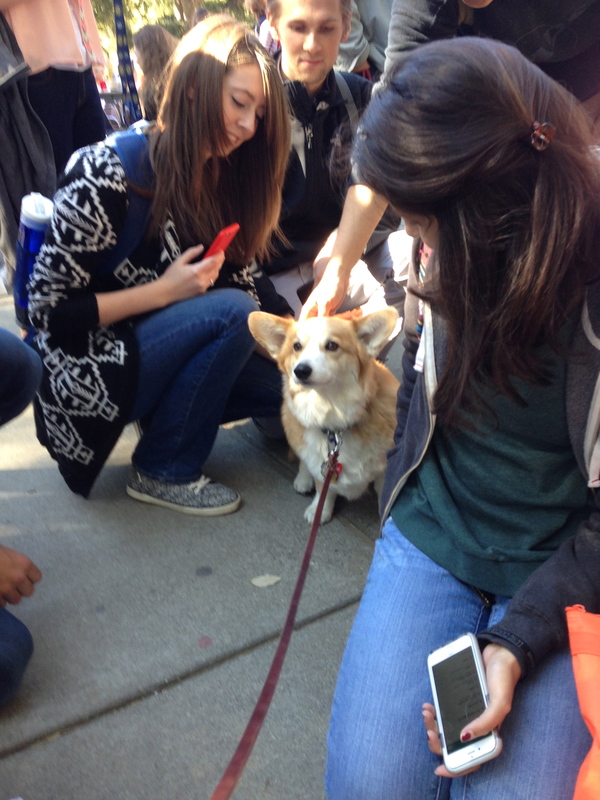 I wish I had seen a Therapy Dog after a few of my finals. It would have made a stressful day much more tolerable. Years ago, we had therapy dogs visit the hospital where I worked. I think they were as good for the staff and they were for our patients. They wore a vest with Therapy Dog embroidered on it. We saw our first therapy dog in a hospital too. It was so eye opening. The dogs really sense what people are going through. This school visit was really fun and positive. Some of the memory care/Alzheimer’s units are a bit difficult. What a great way to help students decompress! My fluffies are short-hairs, but fluffy in heart nonetheless. It was a great way to de-stress after finals. 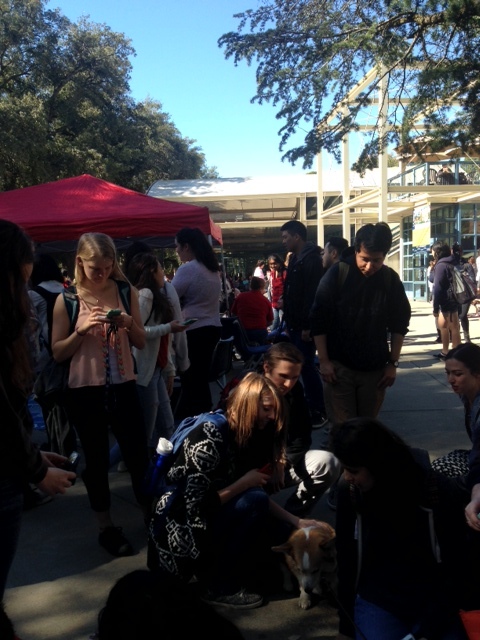 They students really appreciated it and our two little therapy dogs loved all the attention. You had a wagon? Must have gone to a better school than the one I attended. Although, after the invention of the wheel, I did ride a bike to campus. Yet another reason I’m surprised I’m still alive. Tanner and Emma were great during the visit. It was something we will do again. What a great idea. I would have loved this after finals! Me too! This event was a ton of fluffy fun! ← What Color Is Your Asshat?